Carp Island resort in Palau is located at the southern end of the Palauan Island Chain, but it’s smack dab in the middle of Palau’s best SCUBA diving sites. 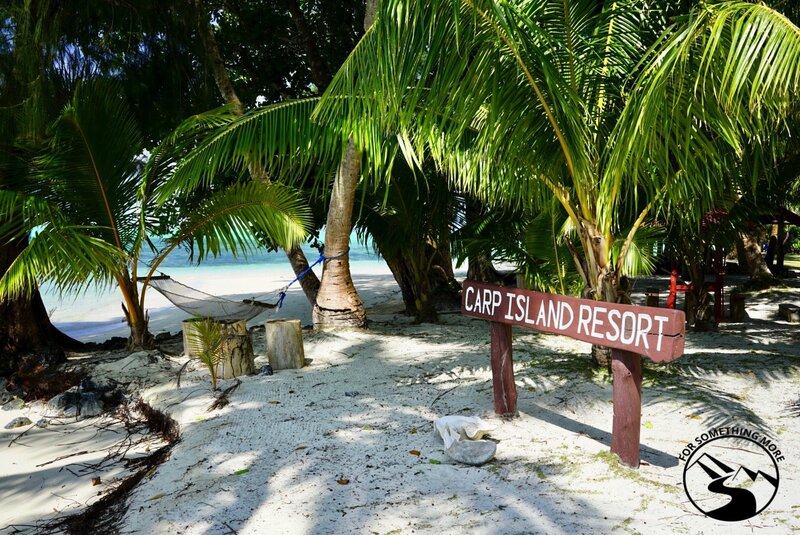 It’s facilities are sufficient and comfortable, yet rustic, so if you’re cool with simple tropical living, we highly recommend you stay at Carp Island. Just to underscore its rustic charm, in spite of Carp Island Resort in Palau using the word resort in its name, it does not have the typical resort amenities, i.e. pool, spa, bar, etc. that is typical of most resorts. So if you’re looking for the pinnacle of luxury, you’ll want to check out other accommodation options in our Palau travel guide (It also covers the information you’ll need in order to get to this remote island nation, essential items to bring, as well as the plethora of activities you’ll be able to do while you’re in Palau.). As an aside, we are NOT affiliates of Carp Island Resort. 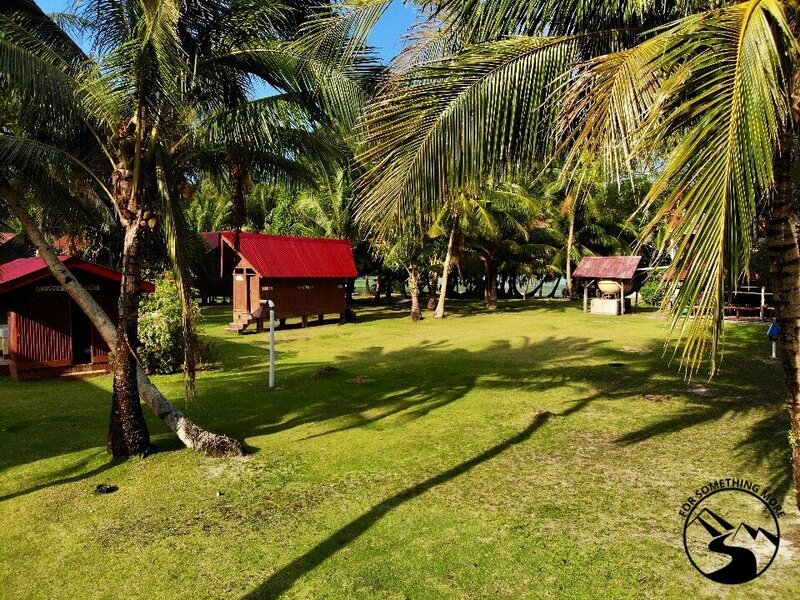 We simply enjoyed our stay there, were thrilled about the magnificent SCUBA diving experiences we had while staying there and would like to share about them with you! 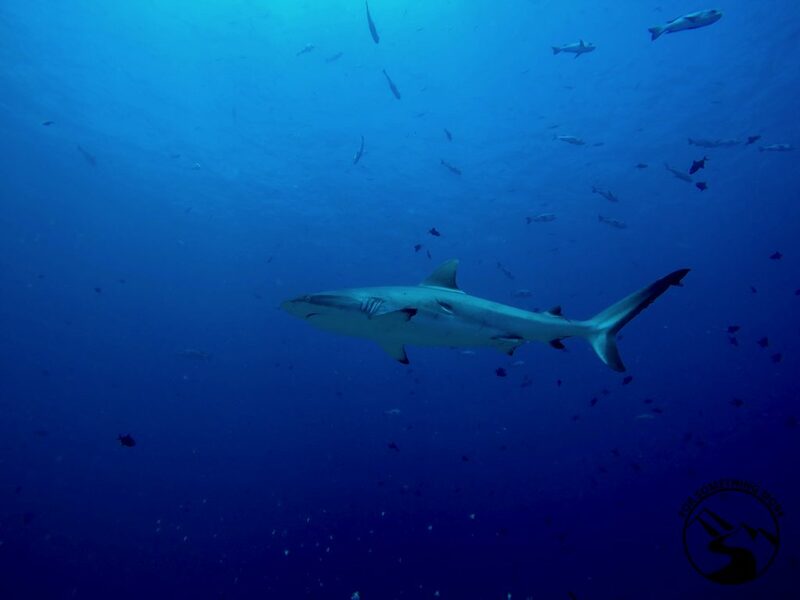 Relatedly, if you are planning on SCUBA diving in Palau, our Palau SCUBA diving guide is something you’ll also want to look at, as you won’t want to miss any of the spectacular dive sites in this marvelously beautiful place. Once you’re in Koror, the folks from Carp Island will pick you up at an agreed upon location, and they’ll take you to their island resort. 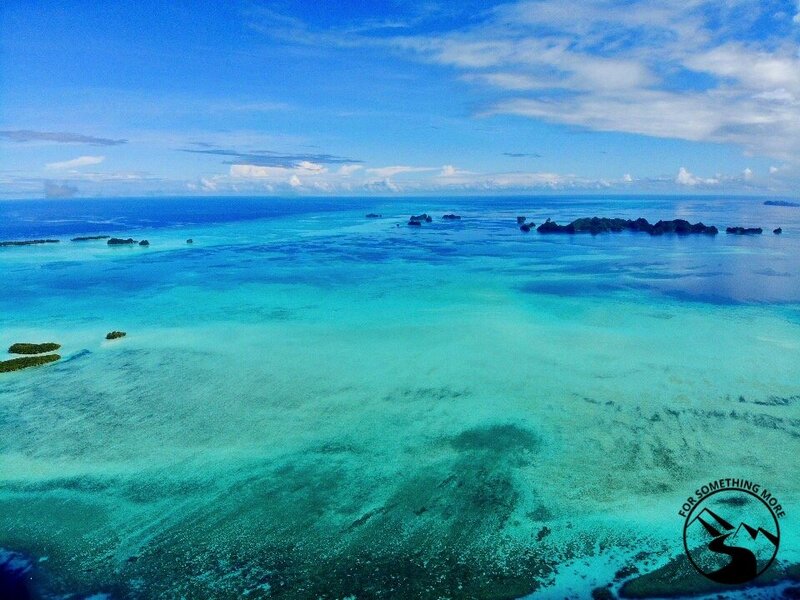 If you don’t know how to get to Koror, check out our Palau travel guide. We met the Carp Island staff at the airport, but we could have met them elsewhere if we had wanted to. Once we were in their caring hands, they checked us in at their Koror office, we then bought a few provisions from the nearby mart, and then we boarded one of their boats. After about 45 minutes of gently weaving through azure blue water sprinkled with islands made of limestone coral uprises, all of which are blanked in lush lime green jungle vegetation, we arrived at the Carp Island Resort in Palau. Along the entire way, all we could think was, “This scenery is something out of a travel magazine or a postcard.” If you make the journey to Carp, we think you’ll have these same thoughts too. 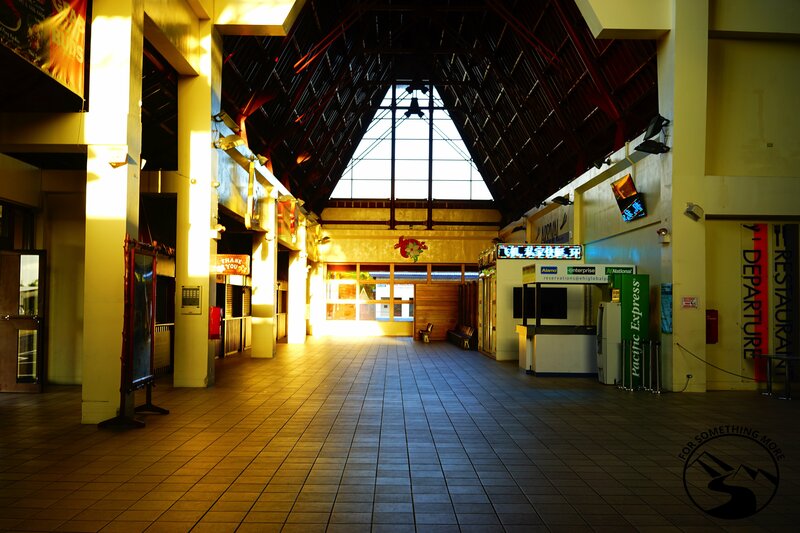 If you arrive in Palau in the middle of the night, yet you don’t want to pay the full price for a hotel room that you’ll only be using for a few hours (until the Carp Island Resort staff pick you up in the morning), consider crashing in The Ocean View Lounge at the airport. If you like warm and calm water, you’ll want to travel to Carp Island Resort between December and March. These are the most expensive times to stay at the Carp Island Resort in Palau, but they are also the nicest in terms of weather. (Check out pricing information for Carp as well as a few other resorts in our Palau travel guide.) The dive sites at this time of year might also be a bit more crowded than usual, but “crowded” in Palau is still virtually void of other divers. We went in March, and the dive sites were FANTASTIC. Check out our Palau SCUBA diving guide for more details. Palau’s low to mid season is April to November. At those times the water becomes a bit cooler and choppy. Accordingly, prices of accommodations are lower in those months. Simply put, you’ll want to bring anything that you’d want to have with you on a deserted tropical island. Of course, Carp Island is hardly deserted, but you get the idea. There are a few things the Carp Island Resort shop sells, but their prices are quite inflated. Here is what we recommend you bring with you. We will start with the most important thing first…Just kidding! But really, if you do care for a drink or two, you’ll want to consider bringing your own alcohol. In Palau, each person is allowed to import 1 bottle of liquor, so you can bring your favorite from home. Carp Island Resort provided us with ample ice. If you don’t want to check alcohol onto the plane, you can buy it from one of the many liquor stores in Koror, but again, island prices are always higher than on the mainland. Carp Island did not provide bug netting for our bed. The bugs weren’t too bad, but if you’re sensitive to bugs, you’ll want to bring your own bug netting for your bed. Also, make sure to bring a piece of string/rope in order to hang the net over the top of your bed. This is somewhat of a no-brainer on a tropical island, but just in case this wasn’t on your radar, bring some bug spray. Stock up on any and all snacks you’d like to have. You might also want to consider bringing provisions for lunch too. Doing so will help keep your trip costs down. BEFORE you get on the Carp Island boat and depart from Koror, you can shop for snacks at this mart nearby to their Koror office. 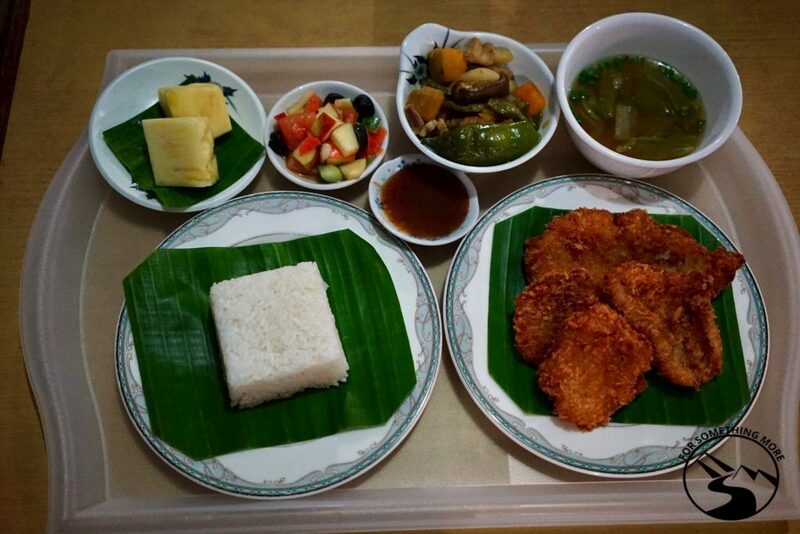 Breakfasts and dinners are included in the price of your room, but lunch is not. If you’d like to purchase lunch from Carp Island, at the time of writing, it was US$10 for a bento box and US$15 for their sit down option. Again, if you’d like to save a bit of money, bring your own snacks and lunch items. When you’re at the Carp Island Resort in Palau, you’ll almost certainly want a wind breaking layer for the evening time, as it got a bit windy and cool. Frankly, wherever we travel, we always bring our rain jackets. They fold up really small, are nearly weightless, and they always give us a little extra warmth if it’s windy. The women’s raincoat we recommend is here, and the men’s raincoat is here. Another item we always travel with is our insulated reusable water bottle. It’s great for the plane ride over, for holding hot coffee in the morning, and for cold drinking water in the warm afternoons. As we’ve mentioned, there is a small shop on the Carp Island Resort in Palau; however, it’s quite expensive, and offers only limited items. When we were there, they had chips, popcorn, biscuits, and trail mix, all of which were ~US$2.50 per item, as well as bottles of liquor (~US$40/bottle), wine (~US$30/bottle) and cans of beer (US$3/can). They also sold some souvenirs such as tee-shirts (~US$25) and stickers (~US$5). Our room on Carp Island embodied a simple living ethic. It was completely comfortable, but it had no frills. What we found most appealing about it was that it was so close to the water that each night we fell asleep to that whooshing sound of the waves gently lapping at the shore. Quite frankly, the location of our room could not have been more perfect. And from what we saw, all of the rooms were as up close and intimately intertwined with the coastline as ours was. Our room and our friend’s room were both clean and tidy. Keep in mind, Carp Island is indeed a rustic place, so if you’re looking for the pseudo-surgical sterility that large chain hotels offer, you’ll want to stay elsewhere. Nevertheless, each day our room was cleaned, and we were satisfied on this front. In any non-island context, we’d not mention the frequency at which our sheets were changed, but on an island, where fresh water is somewhat limited, this is indeed a point of note. To this end, it was quite nice to have new sheets every other day, as in spite of our best efforts to make sure we were sand-free before getting into bed, there somehow always seemed to be a bit of sand in our bed after a day or so. In the spirit of water conservation, Carp Island Resort in Palau gives you the option to change your towels upon request. We simply used our towels each day, hung them out to dry in the sun, and thus only opted to change our towels one time in the 6 nights that we were at the Carp Island Resort in Palau. Neither our room, our friends room nor any of the rooms we saw on Carp Island Resort in Palau had any air conditioning. However, they all had fans. Given the fact that it was never too hot during the day or night, we were quite comfortable even without A/C, and it goes without saying, but Mother Earth was all the happier too! Again, quite a bit to our surprise, there was no bug netting to cover our bed at night. At nearly all the places we’ve been to where bugs might be a problem (India, Thailand, Malaysia, Indonesia, Thailand, Cambodia, Philippines, Sri Lanka, etc.) we have always been provided a bug net to cover our bed. We ended up getting a few bug bites each night, so next time we travel to Carp Island Resort, we’ll definitely bring our own. We will also make sure to bring a piece of string/rope in order to hang our net over the top of our bed. The price information on Carp Island Resort in our Palau travel guide may NOT be up to date. Please only use this as a reference, and for the most up to date information, reach out to Carp Island Resort for the most up to date info. Their contact information is below. As we have said above, Carp Island is charmingly rustic, but there are still a few sweet amenities. Kayak rentals on Carp Island are free! Carp Island Resort has about 5 single person kayaks and 1 double person kayak that you can use for free. All you’ll do is check out a kayak, grab a paddle and a life vest, and you’ll be good to go. If you haven’t already, check out what the kayaking looks like by viewing our Carp Island Resort virtual tour! Don’t forget to bring your water bottle though. You’ll certainly work up a bit of a sweat. There is WIFI on the island, but don’t count on it being super reliable or fast. Nevertheless, for US$5, you can buy a WIFI card that gives you a total of 4 hours of access to their wifi. You don’t have to use it all at once, so as long as you disconnect your device from Carp’s WIFI connection when you’re done, you’ll be able to use your 4 hours spread out over a maximum of 15 days. 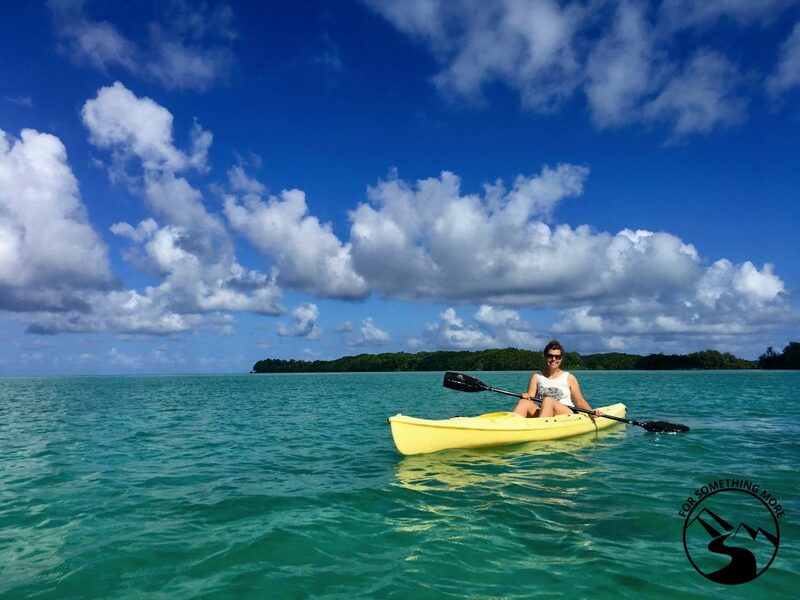 At Carp Island Resort in Palau you can be as active or relaxed as you’d like. Some of the options there are free, and some are fee based. Here is what’s on offer at Carp! 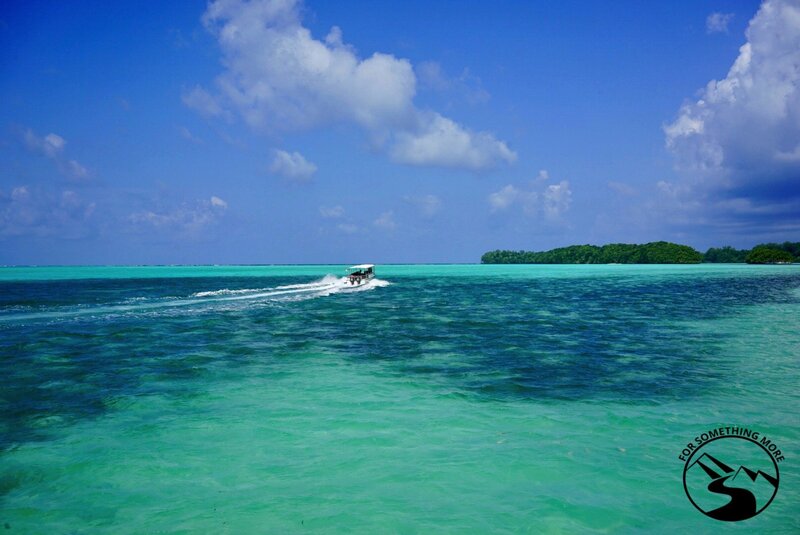 The SCUBA diving at Carp Island Resort was SPECTACULAR. 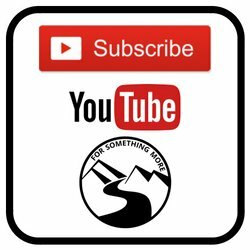 To best see this, check out our SCUBA diving video footage! From massive schools of fish, to manta rays, sharks and turtles galore, I’ll say it again because it’s so true – The diving at Carp was spectacular! Our dive guide, Beau, was also top notch. He was calm, cool, collected and HIGHLY experienced and passionate about diving. He was also VASTLY knowledgeable about the marine life in Palau. Check out our Palau SCUBA diving guide for all the details you’ll need to ensure you don’t miss out on any of Palau’s key diving spots. Even if you’re not a SCUBA diver, you can still see much of Palau’s pristine underwater world. We did not do any snorkeling ourselves, but some other guests we befriend did go snorkeling, and they were thrilled with their experience. In a single session, they saw manta rays, sharks and again many turtles. 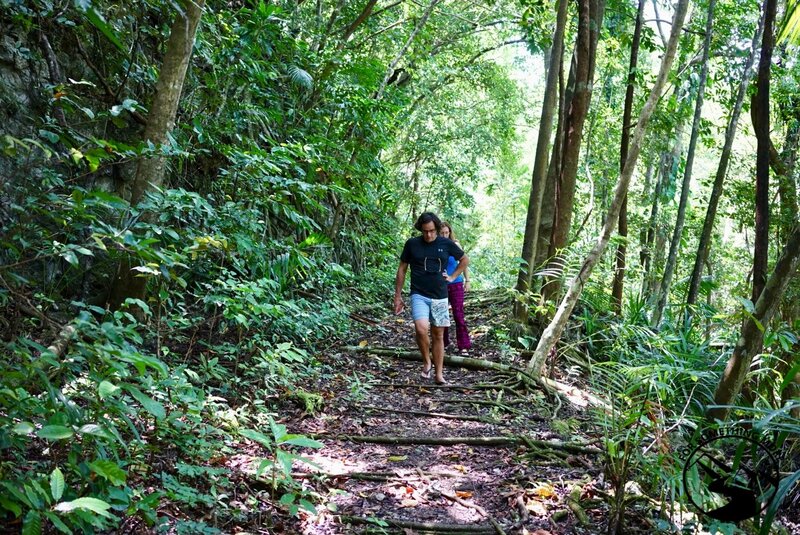 Jungle walking is thrilling, just watch out for snakes! On your phone or camera, take a picture of the Carp Island hiking map, and then head out for a nice jungle walk to the far end of Carp Island. This ~30 minute jungle trek will take you through patches of mangrove forest, right past their famous Stone Money Rock (a big circular rock that looks like a traditional Palauan coin) and will pop you out on a nice white sand beach on the most remote side of Carp Island. If you bring some snacks and water with you on this trek, you could make a nice little picnic out of the whole experience. A word of WARNING: There are poisonous Banded Sea Krait snakes that live around Carp Island. They are VERY docile, seldom attack humans and more often than not will simply slither off if startled. However, when the tide is low, they do like to rest in the small water-filled sea grass patches, so just keep an eye out for where you step if you venture out onto the sandbars at low tide. We had a GREAT time doing just that, we only saw one snake, and it posed NO threat to us at all, but we wanted you to be aware of this detail. En route to the various SCUBA diving sites, we unavoidably got a bit of an island touring experience, however, we never explicitly opted to take such a tour. 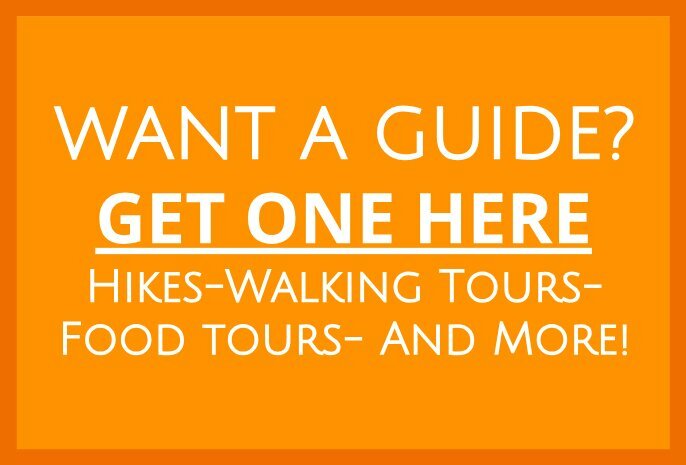 Nevertheless, other guests told us the island tour was a great experience, so you’ll certainly want to consider this option if you’re in the mood for some laid back fun. Again, we never went fishing, but when we went SCUBA diving, and we saw an unreal amount of fish. If you like fishing, Palau will surely not disappoint. We didn’t go birdwatching either, but we saw a TON of birds flying about! If you’re a bird watcher, Carp Island Resort is a great spot to do this. In fact, on the Palau immigration entry form, in the section where it asked why you wanted to enter the country, bird watching was listed as one of the options! This almost need not be said, but sometimes the most obvious things in life are the hardest to see. If you want to get your tan on, you’ll have plenty of chances to do this on Carp Island. The food on Carp Island was delicious, and the meal design was reliable. I say reliable because each meal had the same structure. Breakfast was a protein (eggs and/or sausage) with salad, soup and toast or rice. Lunch was a protein with vegetables and rice, as well as some small pickled side dishes. Dinner too was a protein, rice, salad, pickled sides and some fruit for dessert. On a few nights, dinner even included some freshly caught tuna sashimi! Breakfast and dinners are included in the price of your room. You can opt to buy lunch, or you can eat your own food for lunch. Lunch bento boxes are US$10, and the sit down option is US$15. If you’d like to, you can save a few bucks if you plan ahead and bring your own food for lunches. When you make your booking at Carp Island Resort in Palau, make sure to note any dietary restrictions you have, and they will be able to accommodate you. We found both email and phone to be equally as effective ways to communicate with Carp Island. Craft Your Own Off the Beaten Path Adventure Travel Experience at Carp Island! 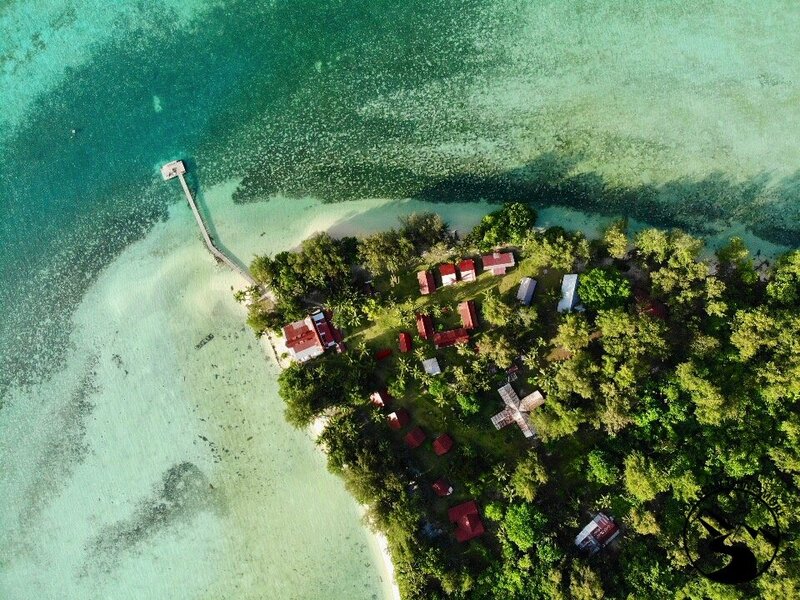 At this point you have all the info you need (and probably more) to craft your own experience at Carp Island Resort in Palau. On the off chance that you’re wanderlust itch is not completely scratched by Carp Island, while you’re in this part of the world you should consider checking out another nearby tropical destination, El Nido in the Philippines or Tubbataha, one of the best SCUBA diving sites in the world. No matter what you decide, if you have any questions for us, feel free to reach out to us here, or leave us a comment in the comment section below!